Da Capo Press, 9780786716531, 480pp. On sabbatical from his professorship at the University of Pittsburgh, native West Virginian Chuck Kinder (portrayed as Grady Tripp in Michael Chabon’s Wonder Boys and played by Michael Douglas in the film) makes a midlife pilgrimage to his homeland to re-imagine and reconnect with that fabled, fantastic country. Confronting the regrets and heartaches of his past, present, and future, Kinder seeks solace in the funny and raunchy family stories, lies, legends, and history that reside in West Virginia’s haunted hills and the hollows of his memory. But more than anything, Kinder wants to live it up hillbilly style. Immersing himself among the lives of mountaineer characters, both the quick and the dead, the bad-boy author bears holy witness to the triumphs and misdeeds of the loafers and misfits, winos and oddball characters of his homeland. Readers will be astonished by tales of bloody mine wars, outlaws on the run, roadhouse romance, barroom brawlers, beer-joint ballerinas, and a man who calls himself the last mountain dancer. With mothmen, moonshiners, and family feudists, it’s Planet West Virginia. 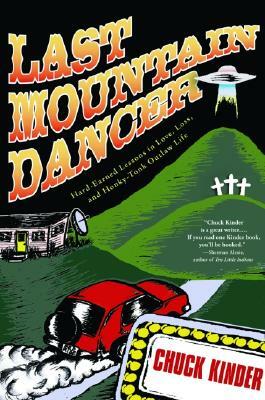 Chuck Kinder's wild-ride rediscovery of his West Virginian roots is sure to quicken all of our hillbilly hearts. Chuck Kinder is a native West Virginian. He has worked as a coal miner, bartender, bouncer, bandit, cook, and college professor. As a young itinerant professor he taught at Stanford University, the University of California at Davis, and the University of Alabam at Tuscaloosa. The auhtor of the novels SNAKEHUNTER, SILVER GHOST, and HONEYMOONERS, Kinder is well-known as the real-life counterpart to Grady Tripp, the professor played by Michael Douglas in the film based on Michael Chabon's WONDER BOYS. He is currently Director of the Writing Program at the University of Pittsburgh.